This set evolved from Daro's classic Reno range. this timeless design uses all the elements of Daro's advanced production techniques with great attention to detail. The rope effect twist on the three Cane pole arms and the leather bindings on the intricate side panel decorations are proof of this. 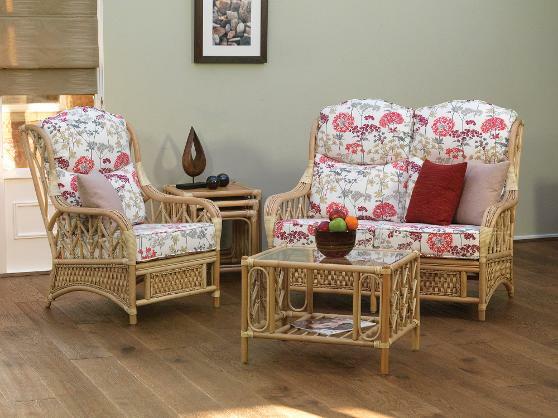 With the widest selection of items in any range, you can choose from 1, 2 or 3 seat options, side, coffee and nests of tables as well as a footstool and entertainment unit. A four seater dining set is available to compliment the this range. The Oakham range is available in either Light Natural Wash or Cappuccino Wash. Shown in Light Natural Wash finish with Hemlock Ruby, Lavender and Terracotta fabric. Oakham Nest of Tables, shown in Light Natural Wash finish. Oakham Entertainment Unit, shown in Light Natural Wash finish.